You will agree with me that a fireplace hearth at home is usually functional and fine looking.However, these areas usually pose a severe safety risk in homes with young children. This is because fireplace surfaces usually become very hot when fire is in use and the fact that the flames,colors and smoke also attract kids to naturally go towards them. Installing these gates around the fireplace will prevent your kid from accessing the fire or from getting bruises or cuts that they might get after hitting the edge of the fireplace. These extra wide gates are usually designed to be fitted around the fire hearth. They are constructed with special type of material that is able to withstand the heat. 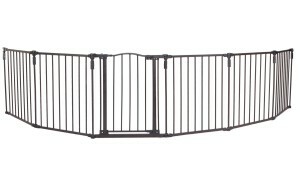 Some of these gates are fold-able for easier storage and others can be used as free standing play yards or used at the bottom of stairs or around barbecues areas. These gates are a physical barrier that aids in keeping your kids safe from the fire so that they are positioned at a secure space away from the fire. Even if you have these gates in place, it is important to ensure that you do not leave your kids unattended when fire is ongoing. It is important to choose sturdy, heat resistant gates that kids cannot lean or push them. This extra wide barrier is a metal gate that has 6 adjustable and detachable panels measuring 30-inches high and a walk through swinging panel. The panels cover width of about ten square feet. This walk through panel has a dual-locking system that is child proof for added safety. The gate features sturdy powder coated metal construction. Apart from being used as a fireplace screen, it can also be used as a play yard for children or as a barrier to block off potentially hazardous areas or even to make an enclosed area for recreation. Here is a 2 panel extension kit that you can buy separately to cover additional space. This two panels perfectly matches the North States Superyard 3 in 1 Metal Gate. The panel attaches directly to the gate in order to extend the gate from ten square feet to about nineteen square feet. This auto close gate features durable heavy-duty steel construction. The gate has five sections comprising 4 fence type sections and a walk-through door section. The connections of the sections pivot to whichever angle. You can remove and rearrange the sections to your desired configuration. The door has an auto latch featuring double magnet lock which automatically locks the gate. The wide door has a hold open feature which normally suspends the automatic close function in order to allow free traffic. The gate is installed easily with the wall-mount adjustable hardware that allows you to configure to diverse positions. The gate is 132 inches wide and 29.5 inches in height. 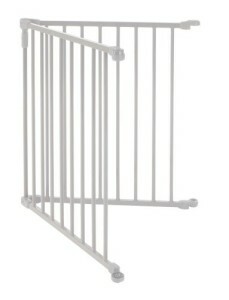 This extra wide gate can be used around the fireplace or as a play yard both indoors and outdoors. It features durable metal construction with a matte bronze finish. It has 6 detachable and flexible panels. The walk through door has a self-closing design with a dual-lock system that is child proof and also has a hold open feature for easier access.The panels have joints that easily adjust and rotate to allow you to place the gate the precise shape for your room. The included brackets meant for hardware mounting secure panels from one side of the wall to another. It covers 144 inches wide and 30 inches high. It is easy to install and remove. You can shorten it by removing some panels or buy 2 other available panels that are sold separately to have it cover a longer area. This wooden gate has 6 adjustable and removable panels. The attractive wood has a nice honey color. It measures 30 inches high and extends to 144 inches wide. It has wall mounting hardware included. It has a walk-through swing panel with a double-locking child-proof system.An extension kit is sold separately here. 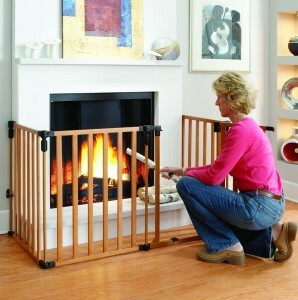 Use a safe fireplace baby gate and get to enjoy the warm environment without worrying about your young ones.